Is there a better alternative to CG Invoicer? Is CG Invoicer really the best app in Finance category? Will CG Invoicer work good on macOS 10.13.4? CG Invoicer helps with your administrative needs so you can focus on driving the growth of your business. Anyone in his or her own business can benefit from this product, from personal trainers to wedding planners to online auctioneers. An email feature is included so that users of this software are able to send and receive emails without having to open another email program. You can use the email ability to send out newsletters, product announcements and general communications. It generates invoices with the click of a button and keeps them for later reference, so you will always be on top of your outstanding invoices. Note: Finder and MacUpdate Desktop report a version number of 13.0.3 for this app, which is reflective of its FileMaker runtime version. The developer refers to it as version 3.5. CG Invoicer needs a rating. Be the first to rate this app and get the discussion started! It generates invoices with the click of a button and keeps them for later reference, so you will always be on top of your outstanding invoices. 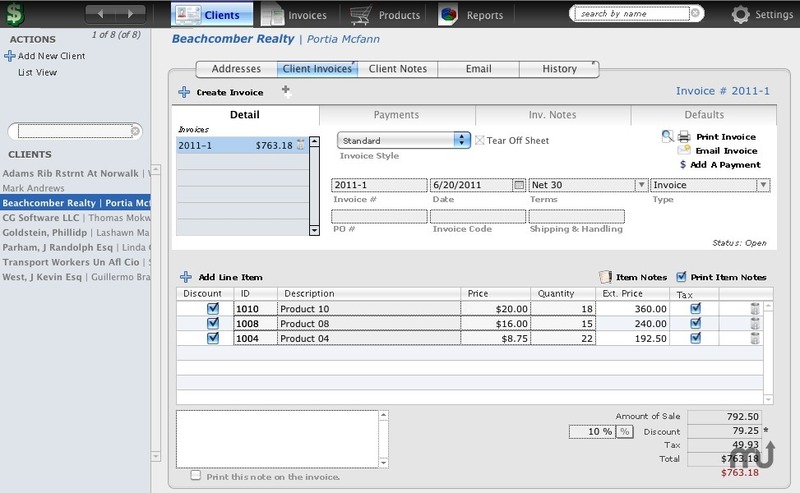 It has reporting features to show all open invoices or just ones that have been open thirty days or longer. You can also create reports of all products or services sold to each customer, to maintain a clear perspective of your best customers.